I have been having Internet difficulties, so today's post did not happen as I planned. I hope to be “back in the blogosphere” in full force next week, catching up on as much as I can that I have missed reading over the past few weeks. In the meantime, today I am sharing something that made me smile. I saved this link after seeing it on Facebook one day. I don't think you even have to be a passionate animal lover to appreciate it. Be sure to read the story that accompanies the photos. I hope it makes you smile, and reminds you of how sometimes the seemingly impossible really is impossible. Man Rescues Newborn Flying Squirrel Against All Odds. I just finished instilling eye drops in my dog's eyes. Thought I don't really consider myself a parent to my pets, her recent bout of canine conjunctivitis inspired me to write this post. My grandmother's cat (transported, hissing in a fabric laundry bag) when he was severely injured in a fight. Our sheepdog, after he pounced on and bit a porcupine. He had so many quills in his paws and throat, anesthesia had to be given before they could be removed. My Irish Setter, a tumor (found to be benign) was removed from her shoulder. I'm sure that perhaps our pets received immunizations and some check-ups, of which my memory is just hazy. I do know, however, that my parents never visited a veterinarian with anywhere close to the same sort of frequency that I have. I drew the line at fish. They never saw a vet! But, when our goldfish became ill, I did scour the Internet for a cure, and treated them with a variety of medications. One fish survived (for a few more years) and the other did not. The Beta fish‚ lived only a short life with us, and was greatly mourned. The turtle was a summer pet, released back into the wild by my small children in time to hibernate, probably better nourished and healthier than when he wandered into our lives! A series of steroid injections for the cat, due to a diagnosis of irritable bowel syndrome. A barium swallow, X-rays and special dog food when the dog was a puppy. 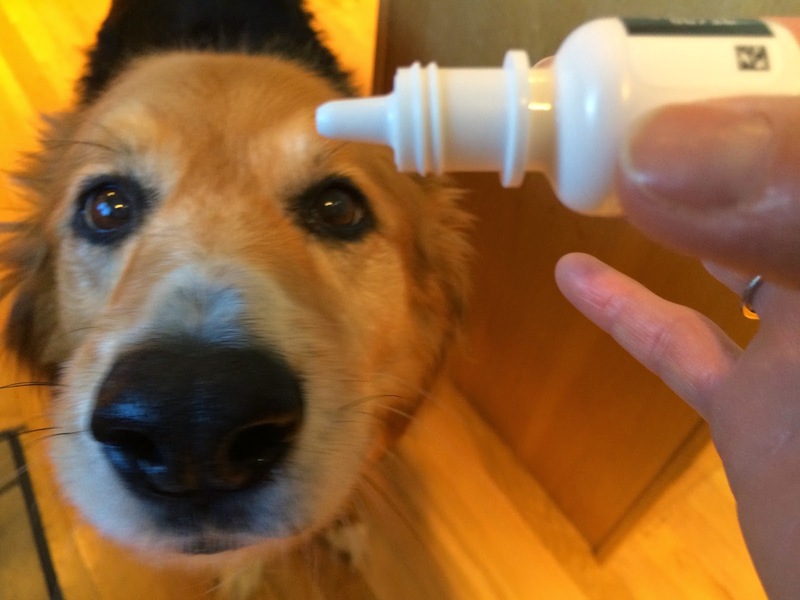 Several rounds of eye drops; and I've become skilled at obtaining urine samples from the dog! A horrible bout of kennel cough (dog) and a wet sneezy cold (cat). Surgeries (4 for the cat and 2 for the dog.) Even as I write this, I can hardly believe that myself! Are these pets just sicker than the ones of my youth? Are we more tuned in to their health because they live indoors, in close proximity with us? Or - did we just treat animals differently in the past, and allow more of their ailments to heal themselves? I'm not sure. But, I do know that every pet I have every owned has been extremely well-loved! How well do you know your vet? On February 3rd, 2015, a journalism project called Across Women's Lives was launched. It is the result of a media partnership between She Knows Media and Public Radio International. I accepted an invitation from Blogher to participate. I am embarrassed that my involvement has gotten off to a slow start, but I am looking forward to sharing and writing more posts on this topic in the future. Today I am adding my voice to the #womenslives campaign by sharing a link to an article I wrote earlier, and expanding on the theme of gender equality. On June 30th, 2014, I published a blog post “Like a girl and Proud of It.” In it, I shared the video for the Always "Like a Girl" campaign that I had just seen on Facebook. The phrase “like a girl” has traditionally (sadly) referred to doing something weaker or with less ability than a boy/man could do. In my article, I proudly gave an example of how my daughter, as a competitive swimmer, has challenged this ridiculous stereotype. You can read my previous blog post and see the Always campaign video by clicking here: Like a Girl and Proud of It. Writing and journalism are now common career choices for women, although they were not always an option. 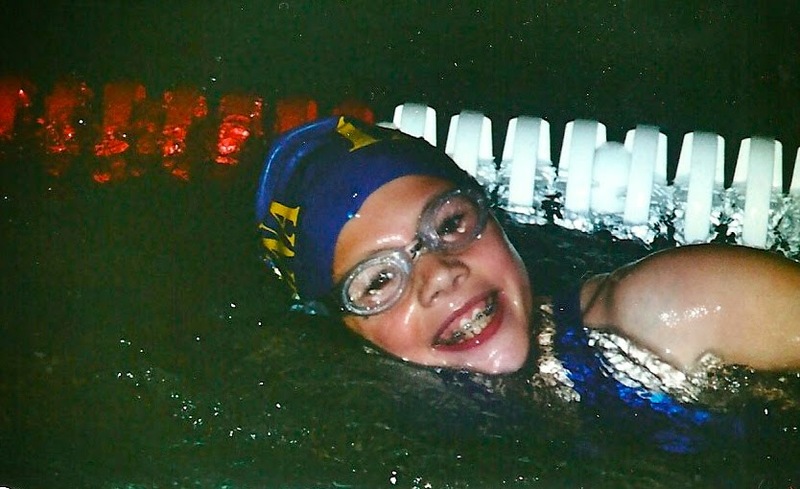 My daughter has written several published articles, so perhaps it could be said that she not only swims "like a girl," but writes "like one" too! Our society is beginning to understand that accomplishments are not often defined by gender. Efforts such as the “Like a Girl” campaign are in-part responsible for this changing mindset. Proof of this is how tremendously popular the hashtag #likeagirl became, when the video aired as a commercial during Super Bowl Sunday. I read a written criticism of the "like a girl" slogan by someone who pointed out that “athletes are athletes,” and since we don't say “like a boy” why should we say “like a girl”? My argument would be that we must say it. It is only by associating these words with what a girl can truly accomplish, that we can break the previous stereotype associated with the phrase. Ideally, hopefully soon, there will be no limitation of accomplishments imposed, implied or assumed by gender; and efforts - whether male or female - will be equally recognized and compensated. What is an example of gender inequality you feel needs to be changed? I know quite a few people who consider German Chocolate cake their favorite cake, including both my husband and a friend we had over for dinner last night. Our guest's birthday is tomorrow, so deciding what to make for dessert yesterday was easy. The recipe I use to make German Chocolate cake is unusual, and always such a hit that I have chosen to “shine my Saturday Spotlight” on it today! 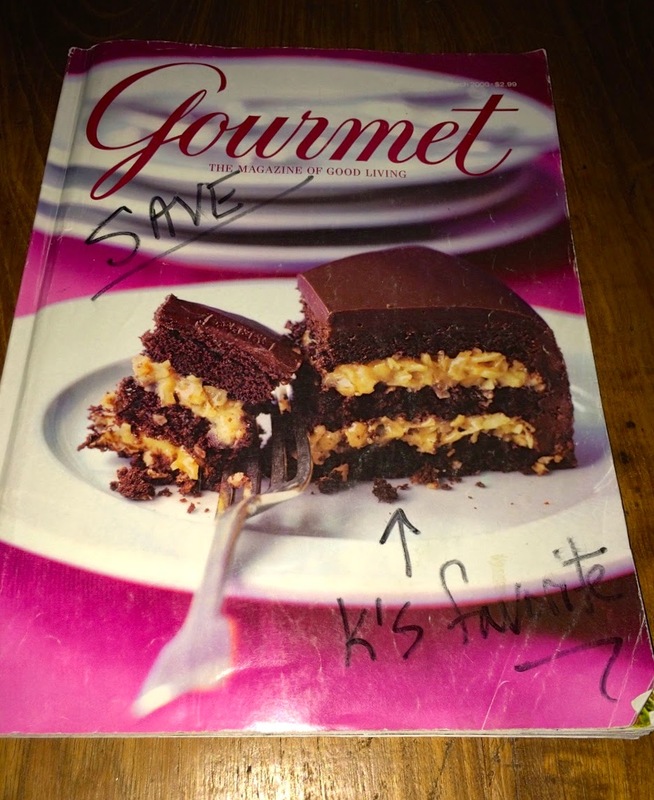 A dear friend has given my husband and me a subscription to a cooking magazine every year since we have been married - first Gourmet, until it was no longer published, and most recently Fine Cooking. I have discovered many good recipes from these magazines over the years. When I saw the Inside-Out German Chocolate Cake recipe published in the March 2000 edition, I knew I had to make it for my husband's upcoming birthday. I have made it nearly every year since! When I decided to add my words to the 1000 Voices Speak for Compassion campaign, it seemed it would be an easy article to write. Once I began, however, I realized compassion is more complicated than I thought. Considering this topic, I ended up with more questions than answers. I am sharing them and my thoughts here, but I'm curious about other people's opinions. I hope you'll write some of your ideas and experiences with compassion in the comment section after reading this post. 1. Can an infant be compassionate? Babies may not be capable of being compassionate to others, but they are self-compassionate. They recognize their own sufferings, and cry as a way to obtain relief. I have heard of twins born holding hands, and I know that some sets of twin newborns seem to be comforted by each other's presence. I wonder if these behaviors originate from concern for each other, a result of their own needs, or are they simply due to proximity? 2. Is a child born with a caring personality or is it learned? If so, how? I remember compassion shown by both my children at an early age, perhaps nearly as soon as they could talk. I don't know if caring for others is an innate component of a child's personality, learned by example, or developed through a process of teaching and reinforcement? My best guess is that small children have the ability to recognize that others can have feelings similar to theirs, and their compassion stems from treating others as they themselves would want to be treated. 3. Are some people more compassionate than others? As a nurse, my feelings of compassion were a vital motivation for providing good care to my patients every day. I tend to be compassionate much of the time in my personal life as well. I wonder if the compassionate nature of many nurses is reinforced by the suffering they encounter daily, or is it simply the reason she/he became a nurse in the first place? Do some people feel a greater degree of discomfort than others, when faced with suffering they perceive is being experienced? 4. Can compassion occur between humans and other species? During a long hike, our dog's paw became sore and bleeding. We placed an extra hiking sock on her foot to protect it, and my husband carried her 50 pounds down part of the trail, increasing his discomfort to relieve hers. That same dog, rushed over and licked tears from my face, the day I sat surrounded by Halloween decorations - sobbing because I just realized my child who had moved away might never be home again during the time of year Halloween decorations are displayed. I'm pretty sure she was comforting me, not just craving salt! 5. Is society compassionate enough? When we realize a beloved dog has no good days left, we may end her misery with euthanasia. Human lives are more complicated and therefore not often treated as kindly. 6. Is being compassionate ever a bad thing? Sometimes I suspect my compassionate tendencies may be a fault. I can be too quick to rush in and try to solve another person's problem. It is important to recognize when a person just wants someone to listen - to not give advice or fix whatever it is that is making them suffer. My first tendency is often to reassure another person that everything will be okay - when perhaps that may not be the case. At times, this type of hope can be helpful, but I realize that offering it may be my way of making myself feel better, and it may not be what is best for that person at the time. 7. What is the most compassionate thing I have ever done? I have been thinking about this for a while, and my honest answer is that I truly have no idea! I read somewhere that the recipient of an act of compassion is much more likely to remember it than the provider. Working a full shift without taking a food or bathroom break to ensure the comfort and safety of hospital patients. Working double shifts on Christmas, so a coworker won't have to miss being home with her small children. Staying up all night with a child who is sick or needs the comforting presence of a parent. I told my son I was having difficulty deciding what my most compassionate act has ever been. He immediately replied with humor, “Giving birth to me!” While childbirth is hard, it is not an act of compassion, but a wonderful gift! 8. What is the most compassionate thing anyone has ever done for me? Again, I do not have just one answer for this. What first came to mind, however, was something that happened when I was a freshman in college. I had broken my leg, and was on crutches. It was the very beginning of my second semester of college, and it became evident that I was not mobile enough to benefit from remaining at school. My parents were overseas, and it was decided that I would fly to England to be with them. I forget many of the details, but I remember that my twin sister left her campus several states away to travel (by bus, I think?) to mine. She spent several days packing up the belongings in my dorm room and offering me the emotional support that I so desperately needed at the time. Her actions were the true definition of compassion. I love the fact that over 1000 bloggers from around the globe are coming together today to speak about compassion. The world just feels a little kinder! You can read the words of others under the hashtag #1000Speak on various social media sites, such as Google+, Facebook, Twitter, and Pinterest. Can you answer the last two questions I asked myself? If we all make a commitment to being more aware of any compassion shown to us, and take advantage of opportunities to provide compassion, our world will become a kinder place. Your turn! Do you agree with what I have said here? Please share your thoughts about compassion. Today is Ash Wednesday, and the first day of Lent, the season before Easter which many Christians observe as a time to reflect, repent, fast - or refrain from various indulgences. Yesterday, however, was Mardi Gras, or “Fat Tuesday.” Some of the pagan traditions of this holiday became incorporated in the Christian calendar. As the Christian faith spread through the Roman Empire, these festivities became a prelude to Lent, because the leaders of the newly-forming religion decided it was wisest not to prohibit them! Fat Tuesday is the last day to indulge before the season of penance. Over the years, according AmericanCatholic.org, it has been known to be “a raucous, sometimes hedonistic event.” Even in New Orleans, (the American city synonymous with Mardi Gras) the huge street party apparently ends at midnight, in observance of Lent. I could devote several pages to information about Mardi Gras, but if you are interested in learning more, the links I provided here are informative. Various countries around the world celebrate Mardi Gras, but History.com states that Louisiana (the State where New Orleans is located) is “the only state in the USA where it is a legal holiday.” Celebrations and various sorts of observances of this tradition do occur, however, all over the United States. Helena, MT is no exception. For example, Helena Food Share throws an annual fundraising dinner which is an elaborate Mardi Gras party. And this year, the annual Helena Night to Shine Talent Show had a Mardi Gras theme. The 22nd annual Night to Shine talent show took place last night at the Helena Civic Center. High school students from the Helena area, no matter where they go to school and with abilities ranging from music, dance, juggling, martial arts, etc., may audition for this event. This year eighteen performances were selected. In addition to their talent, the confidence these performers must have to perform before a sold out crowd of 2000 people is remarkable. (Ticket prices ranged from $10 to $25, and the show always seems worth much more!) Night to Shine is sponsored by the Helena Community Credit Union, and produced by the Helena High School and Capital High School DECA clubs. 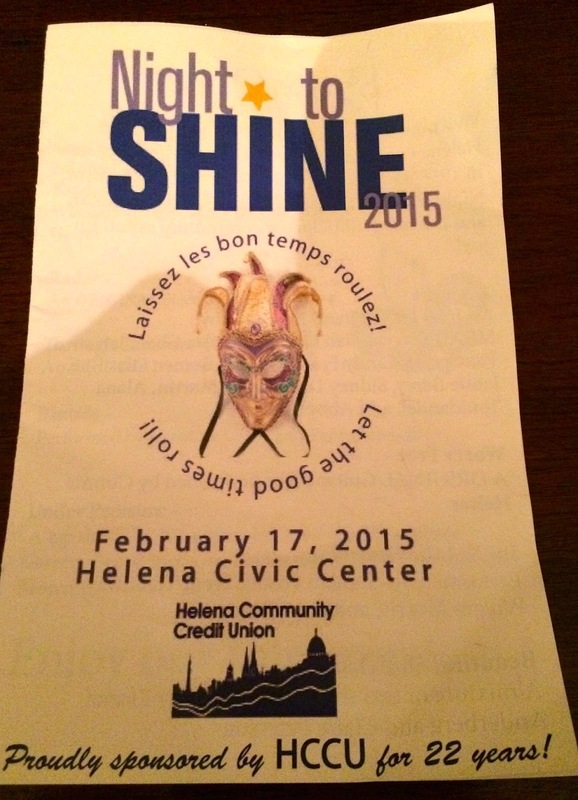 This annual Helena event is always a wonderful evening. My son sings and plays guitar, and he has participated in various acts in Night to Shine for the past three years. This year, the band he belongs to performed a song incorporating piano, rap, beatbox, vocal, and guitar. My Fat Tuesday overindulgence was perhaps pride, as I watched to my son and the other performers dance, sing, and make music last night. Did you do anything to celebrate "Fat Tuesday" this year? This is a sponsored post for which I have received an item to write about. However, what I have written here is an honest expression of my opinions. When I was in fifth grade, it became apparent that my twin sister and I were both having difficulty seeing the blackboard. A visit to the eye doctor confirmed that my sister and I were quite nearsighted, and needed glasses with nearly identical prescriptions! My first pair of glasses did not make me feel pretty, and I dreaded the attention they would draw the first time I wore them. I was quite shy, and the attention I always seemed to receive as an identical twin was more than enough as it was! Me -wearing my first pair of glasses! My new glasses had blue frames and I clearly remember the first day I wore them. I had decided I would quietly slip them on in math class, when I needed them. A good plan, except that a split-second after I did so, my teacher (not realizing my angst) called me to the board to solve a problem. My new accessory was immediately noticed by my classmates; my memory is that they were kind, but there was definitely a reaction! I was overjoyed to switch to contact lenses in tenth grade, and I've never really liked any of my subsequent back-up pairs of glasses ... until my most recent purchase! In the past, I have rated picking out a new pair of glasses just slightly better than shopping for a bathing suit or the right fit of jeans. Selecting my latest pair of frames was actually fun, however - and painless! I accomplished the whole process on-line, from a company called Firmoo! The glasses come with a hard and a soft case, a mini screwdriver, and a cleaning cloth. 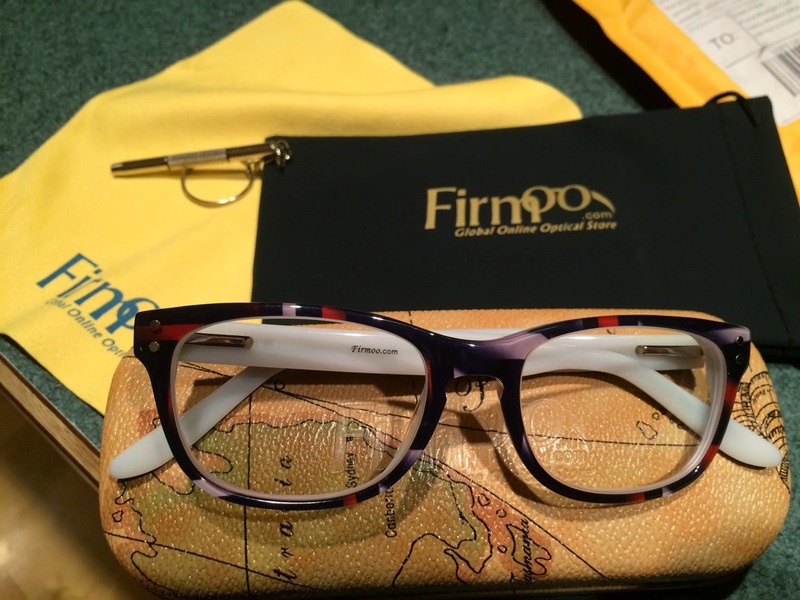 Firmoo has quite a large selection of frames to choose from, and the customer assistance I received via emails was excellent. I took advantage of the option to upload a photo of myself, and see how each frame would look if I was wearing it. This was a wonderful feature. It worked so well, a person must look closely at the photos to know they were photo-shopped! I got a really good idea of just how each frame would look! The photo I uploaded to Firmoo (with the glasses I purchased photo-shopped onto my face) is on the left below, and the photo taken with me actually wearing the glasses is on the right. You can see that the pattern of colors on the frames I received is slightly different than the pair I tried on “virtually.” However, I am very happy with them! Photo of me with the glasses added to it. / Photo of me actually wearing the glasses. I found the directions for providing my prescription and correct size information easy to follow. It helped that I was able to look at the writing on my last pair of glasses for size measurements. 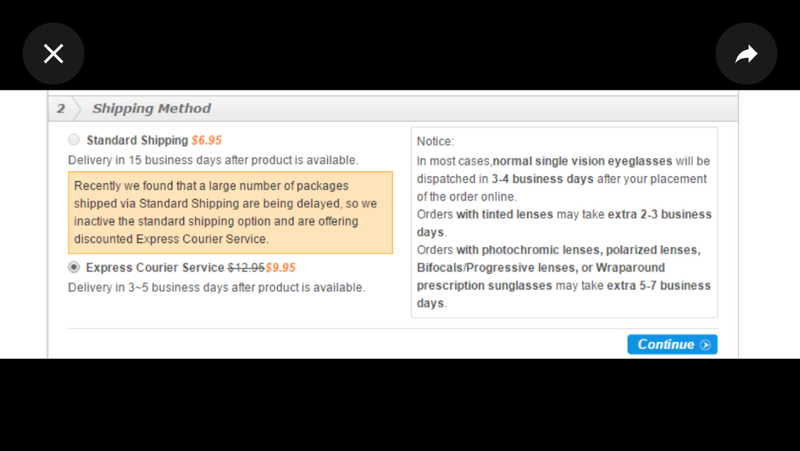 The only glitch was that it took 21 days from the time I placed my order (January 14) until I received my glasses on February 4th. The company was very apologetic for the delay. Apparently they were having a problem with their standard shipping courier company, and have been trying to solve it. In recognition of this inconvenience and until they can get it fixed, I was told they would be offering discounted express shipping for all US customers. I am amazed that these glasses are so reasonably priced. This was a sponsored post but, had I paid full price, my total cost for these prescription glasses would have only been $36 plus $6.95 for shipping. Most frames without the lenses cost more than that! My new glasses are very comfortable, seem sturdy, and have a spring hinge. My college-aged daughter really likes how they look on me - and even encouraged me to wear them instead of my contact lenses when I recently spent a day with her! I have been thinking about getting a pair of computer glasses for when I am wearing my contact lenses and working on the computer. Once I visit my eye doctor and obtain a prescription of this type, I will be ordering them from Firmoo! Here's a few pictures (front view, left and right angles) of me wearing my new glasses. My husband took the photos - he patiently kept shooting until I finally relaxed! (Modeling would not be a career for me!) The fact that I am comfortable sharing these photos says a lot about how much I like these frames - I've always been self-conscious wearing my glasses around anyone that wasn't immediate family! 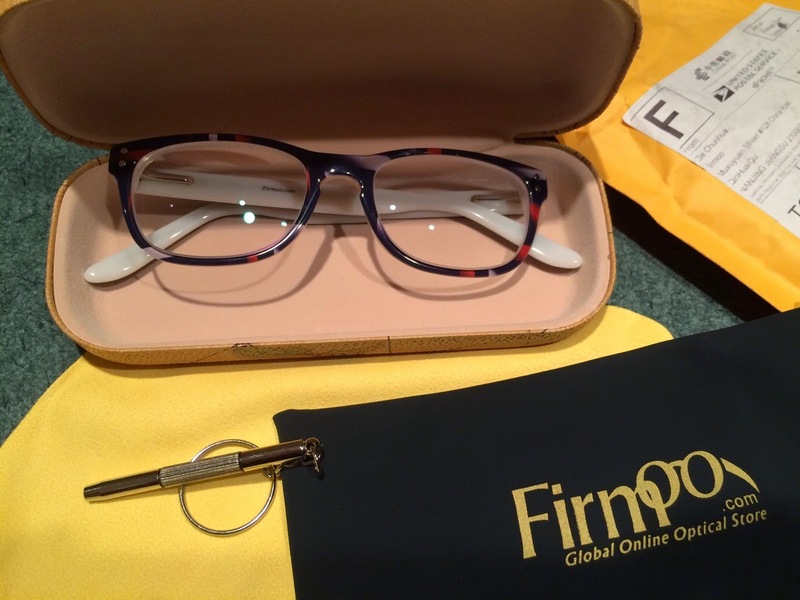 Next time you need glasses, I feel comfortable suggesting that you shop on-line at Firmoo as well. I am very happy with my new glasses! Have you ever ordered glasses online? Would you? Note: In the spirit of full disclosure, I received a product in exchange for writing this post and it contains affiliate links, for which I may receive compensation if any purchases are made. All opinions expressed, however, are entirely my own. Valentine's Day has been dubbed by some people a "Hallmark Holiday." While it is true that sometimes cards are bought more out of obligation and timing than loving sentiment, February 14th can be a nice opportunity for expressions of love. The romance of the holiday can be special, but having been a cardiac nurse I see Valentine's day as an opportunity to promote something even more important. Valentine's Day is synonymous with pink or red hearts. The colorful heart shapes of the holiday can be easily created, by folding a sheet of paper, then drawing half an elliptical shape that comes down to a point,with either end of the line touching the fold. Cut along the line and open the paper, and voila, a heart shape appears. The human heart, however, looks nothing like a Valentine's Day heart. It is about the size of a fist: a hollow pump with four chambers and vessels coming out both the top and bottom. Most people would not consider it pretty, but it is truly a beautiful piece of human machinery. My Saturday Spotlight today shines upon this remarkable body part! Valentine's Day presents the perfect occasion to pay attention to more than just hearts of the artistic or emotional variety. This “heart holiday” is the perfect reminder to us all to pay some attention to the thick muscular organ that lies in our chests, and works rhythmically to keep our oxygenated blood circulating throughout our bodies. Just like the muscles that enable us to lift heavy objects, run, or appear lean and fit; our heart muscle deserves attention. I was at the sink, washing dishes. Suddenly I heard a sound coming from the other side of the counter. I recognized it as the noise my cat makes when he is retching, although it sounded a little different than usual. I rounded the counter, expecting to have to do some cleaning up - and what I saw shocked me. My cat wasn't retching - he was choking. Earlier that day, I had taken the photos for my post It's a Puzzle, in which I published a photo of an apron with a puzzle logo on it. I had laid the apron on the table, and not thought anything of it. 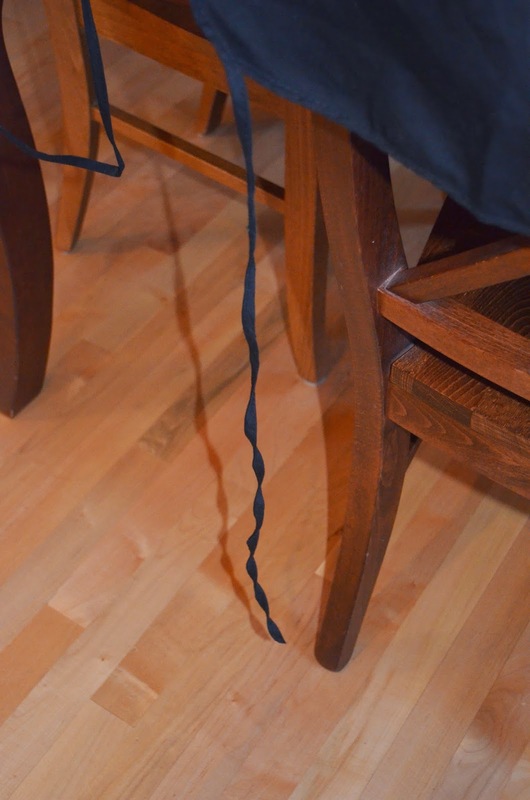 One of the thin apron strings had apparently dangled off the table, catching the cat's attention. He must have started to chew on it, as I saw the end was in his mouth. I ran over and grabbed the apron. I pulled -- and pulled. Finally, the end of a very slimy string appeared - almost all of which had been located somewhere in my cat's GI tract. Had I not been there, I have no idea how he would have dislodged it from his system. We try to never leave elastic bands where our cat can find them. If ingested, they can lead to a blockage or other intestinal issue requiring surgery; yet he will seek out, chew, and swallow any that he can find. Once, he even dug through my purse and pulled one out from there! Curling ribbon, pony-tail holders, and string are equally dangerous. I have even heard of a cat chewing on the thread dangling from a pin cushion, and nearly ingesting the needle. It is up to us to protect our cat from these perils. 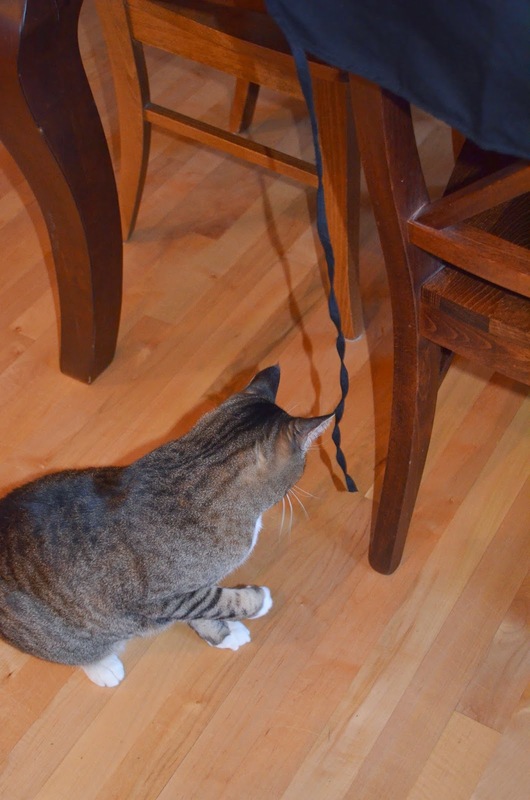 Elastic bands, pony-tail holders and curling ribbons are all household dangers for cats. A thread from a pincushion can tempt a cat to chew on it, and then possibly even swallow the attached needle! It simply never occurred to me that the tie of an apron could become an issue. Fortunately, my cat survived without the need for a trip to the vet. In order to take the photos for this post, I had to get the (now clean) apron back out, and recreate the scene. Immediately, the cat was attracted once again to playing with the apron strings. This time though, I took the apron away before the tie ended up once again down his throat! I'm pretty fond of this cat. I'm glad I was there to help him when he decided to swallow an apron! What other hazards would you list for cats that pet owners should be aware of? For about the past week, my usual blog-writing and blog-reading schedule has been altered. First my computer crashed, and lately I have been doing some traveling. But have no worries, I have been gathering information, photos, and experiences that will add up to some fun blog posts later this month! This picture is a just a tiny hint of what may lay ahead. I was starting to wonder if this bird was going to stand still enough for me to pet him! Today, I just want to provide a few words of caution. They say we “learn from our mistakes,” but I also think we can learn from other people's mistakes. Because of this, I am going to share a story about something I recently failed to do, that could have had some frustrating consequences. A few months ago I purchased a new lap top, with the help of the advice of some of my readers! In the process of starting it up, I somehow didn't get around to scheduling it to back up onto our Time Machine or iCloud. I thought about it at one point, but just never did it. When I turned on my computer one morning last week, the screen was black. And stayed ... black. I tried everything I knew to do, and couldn't get anything to appear on the screen. Fortunately, I had signed up for the Apple Care plan, so I called the Help number. After hours of attempting to diagnose and fix the problem over the phone, they finally concluded that the problem was a software issue. The solution: erase everything from my computer, and reinstall it. "Do you have everything backed up?" The question made me wince. Fortunately, the technician who was helping me was incredibly patient. We finally found a way to retrieve the information on my computer, back it up, and then reinstall all my files and photos. I am very aware of how lucky I was! Even though I only had a few months of information stored on this new computer, it still would have been frustrating to lose it all. For example, the only copies I had of the photos for the Red Velvet Valentine's Day Candy recipe I just published had been on my computer. My choice would have been to either not publish the post, or make a new batch of the pretzel candies and take more photos. I really didn't have enough time to make more candy, especially after the hours I had spent restoring my computer. Fortunately, I didn't have to! 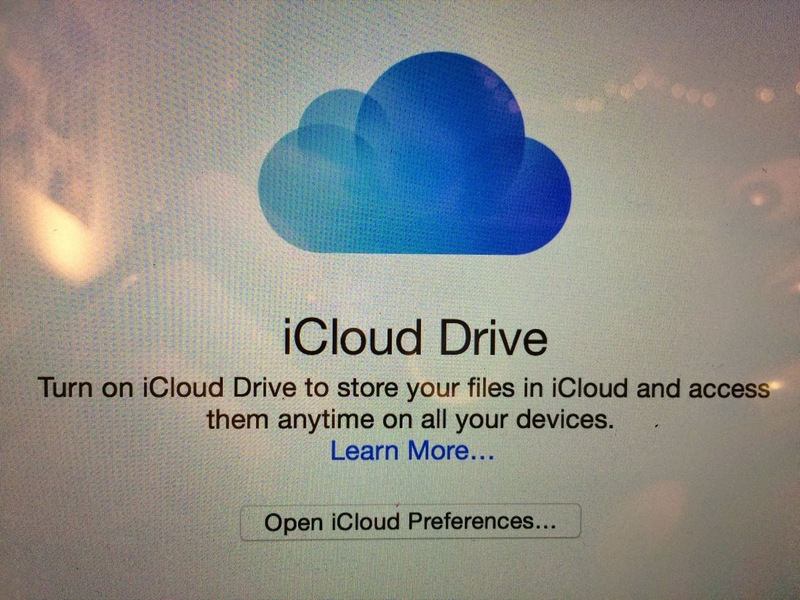 I think that I have learned how important it is to back up a computer, no matter how new it is. I hope that after reading this, you will understand the importance of it as well! 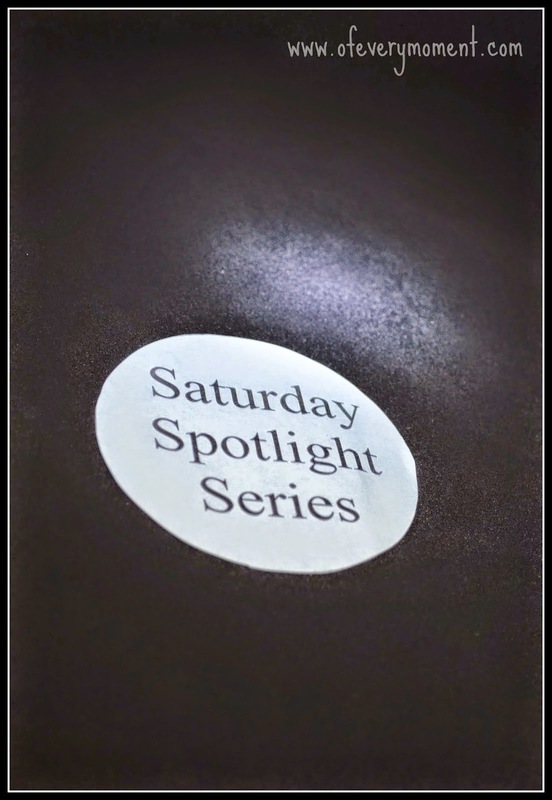 Saturday Spotlight #6: Apple Swan Carvings Are Easy! I always thought that if I tried to carve an apple into a swan, I would only ever achieve an ugly duckling. A video proved me wrong! Have you ever been to a restaurant or a wedding, and wondered how they created the beautiful food sculptures displayed on the buffet table? I always assumed making those sorts of creations took more artistic ability (and patience) than I possess. I recently watched a video, however, from Grant Thompson, The King of Random (embedded at the end of this post) called How to Make an Edible Apple Swan! The video made it sound just too easy. With nothing to lose but time, I decided to give it a try. I was surprised! Within a half hour, I had created not one, but two apple swans! I was so pleased with the result, that I am shining my Saturday Spotlight on the video! The video directions are easy to follow, and although you do have to be careful to not cut your fingers, the instructions for how to use butter knives as a guide makes this less of a risk. I found the apple to be pretty forgiving: if your cuts are slightly off center and sides aren't symmetrical, it just adds character to the swan! Instead of spritzing lemon juice on the finished creation, I used a pastry brush and applied the juice of a lime. (I didn't have a lemon handy!) These seemed to work very well, and the apple slices did not turn brown, even hours later. Yesterday I mentioned my recipe for Crockpot Vegetable-Beef Soup. It is quick and easy to assemble, the ingredients are easily stocked in the freezer and pantry, and this sound is perfect for a fall or wintry day! My sister-in-law gave me the original recipe many years ago. My recipe card shows the signs of wear and tear, as it has been used many, many times. Each time I have prepared this recipe, I have made changes to it to suit my family's preferences. We like this soup better with more potatoes, so I increased the amount to 2 cups. I increased the amount of water/ broth, because of the increased volume of potatoes. What follows is the version of the recipe that I now make quite frequently. Place all ingredients except frozen vegetables into a crock pot and stir. Cook on low overnight, or on high heat for 6 hours. The next morning (or a few hours before serving) add frozen vegetables. Cook until heated through, the meat is done and the vegetables are tender. Serve for lunch or dinner. Do you have a favorite soup recipe that you make often?